2010 was a wonderful year for us, despite a few doggy challenges. As was the case in 2009, our activity in the show ring continues to be limited by work and family commitments, meaning we didn't have the opportunity to attend as many shows as we would have liked. Nevertheless, we had a great time at the shows we did make it to -- due in no small part to our great group of friends and fellow exhibitors here in the Maritimes. We also had a fantastic trip to the American National, where three of our dogs picked up Best of Winners awards and a 4th captured Best of Breed twice plus two Group 2s and an Award of Merit. To say we were proud is an understatement. Just as important as any success we may have had this year, we are so pleased that our breed continues to do well in Canadian show rings. We would like to extend sincere congratulations to all TMT owners who are working hard to keep our breed in the spotlight, including this year's #1 Canadian Toy Manchester, GCh Diventy's Galahad and his owner, Diane Vendittoli. If you have read previous years' reviews, one of the things you may notice this year is the number of new performance titlists on our list. 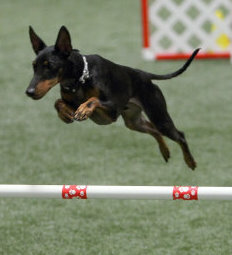 As people learn what smart, versatile dogs TMTs can be, we are seeing more and more of our owners get involved in everything from agility and flyball to tracking and earthdog. We find the whole training process amazing (our own dogs rank among the most unobedient around) and are always thrilled to see them compete. As always, the biggest congratulations and thanks must go to our owners, co-owners, fellow breeders and friends. Whether your dogs are competing in a ring or warming your feet on a cold night as a treasured pet, you are the people who make it possible for us to continue to do what we love. While the list is too long to recount, we do want to send special thanks to Kirsti & Eirik Kahrs for so generously sharing Tux and Drew with us. Importing dogs from Norway was a definite highlight (and challenge!) for this year, but we hope it will be well worth it as we continue our quest to support and expand the breed's gene pool on this continent. Earned her second All-Breed Best in Show this year -- thank you Sandra Lex! 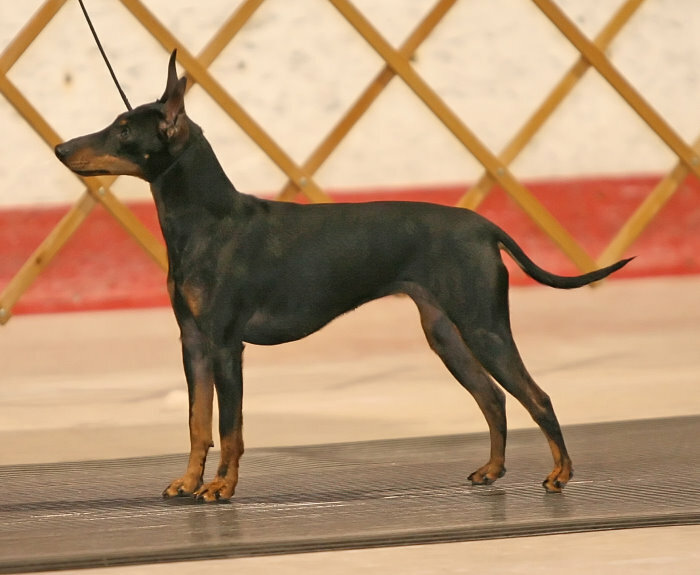 Pixie is hot on the trail of her Canadian Grand Championship and needs only a few more points to complete what is a very challenging title for a dog who definitely has interests and aspirations outside of the conformation ring. 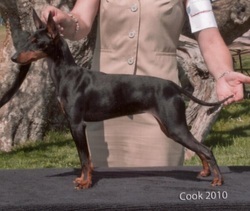 She and Cindy have been fitting conformation shows into a busy agility and obedience training schedule. 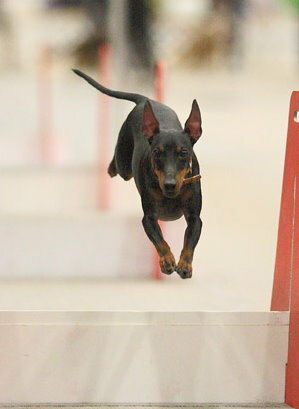 The great news is that Pix is well on her way to earning her first dog sport titles -- something that will be top of mind next year as she works to (we hope) regain her womanly figure after her very first litter! Big thanks to Cindy for making Pixie into the wonderful all around dog she is! 2 All-Breed Best in Shows and a Reserve Best in Show this year -- thank you Bud Haverstock, Carmen Haller and Phyllis Pancel! 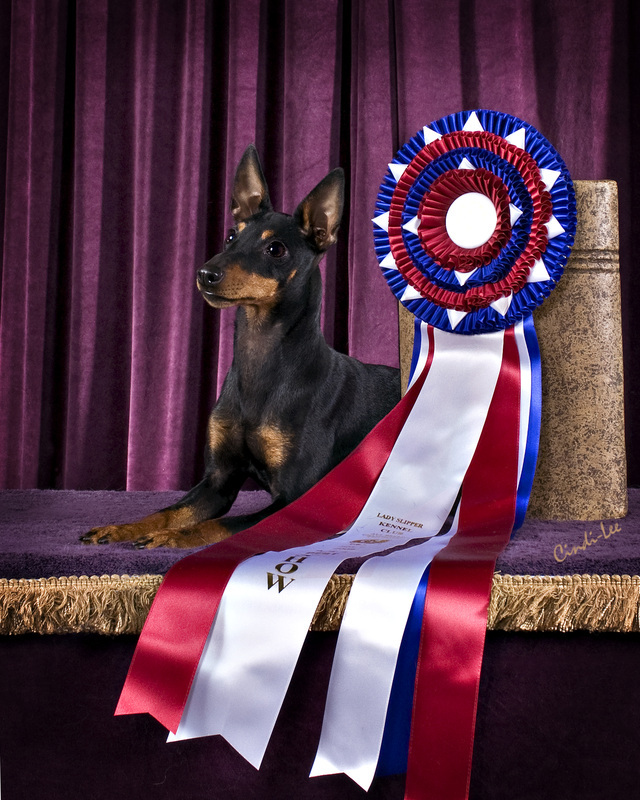 2 majors on the American Manchester Terrier Club National Specialty Weekend, including Best of Winners to her littermate's Best of Breed win! There's no secret that we are quite in love with our Vanna Banana, who not only had a successful year in the show ring but also had her very first litter in August. Vanna is looking forward to finishing her US title in 2011! Hillary started the year off by finishing her US championship with Best of Breeds over Specials and went on to exceed all of our expectations for the year. Though her owners may point to her wins on the US National weekend or to her qualification for Westminster as highlights of 2010, we are most proud of Hilly and Karen's owner-handled group placement in tough California competition. Amanda was so thrilled to have the opportunity to show her at the National, but Hilly's overall success is truly a case study in team work. In addition to her owners, credit must go to Jerri Hobbes for training Hillary so beautifully and to Janell Tonini-Zanotto & Tammi Meyers for showing her so beautifully on several occasions. Bred-By Exhibitor Group 1st in Florida -- thank you Ann Hearn! Gord had a great first weekend out at the National this Fall and has continued to pick up points toward his title since. He continues to mature and his co-breeder/owners are looking forward to having some fun with him in a few years. Moxi quickly finished her title with several nice wins under her belt. She is currently at home where we're sure she is driving her Mom, Blossom, nuts! Kaiden only began competing at the beginning of this year and he and Darlene quickly earned his Flyball Dog Excellent title. We're told his turn on the box is excellent and we're sure there will be lots more news to come from this team. Hopefully we will have a chance to see him run sometime in 2011! Jeff has put so much time and effort into reforming Loki! We're sure this pair will have lots of fun in 2011 competing against sister Freya, whose Tracking Dog and Agility training continues.